RunGo is the best running app for exploring new routes with turn-by-turn voice navigation. Build your own route, or select one of the 100,000+ routes worldwide, and let RunGo guide you. 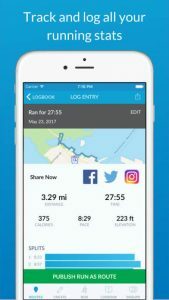 RunGo also tracks your run stats like time, pace, splits, distance and elevation. Optimized design to support the new iPhone X. Explore routes with clear voice directions as you approach each turn. Get notified when you go off route and have the option to share your exact location with others. RunGo is Accessible and supports VoiceOver for visually impaired users. Create your own custom routes by drawing them right on your iPhone. It takes seconds to set up a route and share them with your friends if needed. RunGo also allows you to create routes from GPX files and convert your previous freestyle runs to routes. Browse through a library of over 90,000 routes worldwide to find amazing runs in major running cities such as Vancouver, San Francisco, LA, Boston, New York, Chicago, London, UK and Sydney, Australia + many more. Updated in real time, you can view and record your time, pace, distance & elevation as you run. Once you have completed a run, you can save it to your logbook for future reference. Share your runs with friends and family via Twitter, Facebook, Instagram or E-mail. RunGo Live! lets friends and family track your runs and races in real time on any mobile or desktop web browser. Easily follow interval workouts by simply adding them to the app. With RunGo, you can follow any route and track any run without using cellular data. Listen to your music while still getting turn by turn voice navigation! RunGo will simply lower the volume of your music to announce directions and then resumes to your music volume. Get turn by turn directions on your wrist without needing your iPhone with RunGo’s Apple Watch app for Series 2**! One of a kind feature allows you to Pause, Resume & Stop your runs with a spin of your Apple Watch’s Digital Crown for those rainy day runs or ones that work up a sweat. Send any route from iPhone to the Apple Watch in seconds. Completed workouts are automatically synced to RunGo with a summary of your run. Works with Apple Watch Series 1 with your iPhone and requires watchOS 3.1.3 or higher.